Welcome to the January issue! Happy New Year! Let’s make 2014 a year of making memories and preserving life stories! Let’s save life stories in 2014. I remember this distinctly. I’m about twelve years old. I’m lying on the living room couch, calculating how old I’ll be when the calendar flips over to the year 2000. My little-kid mind boggles when it realizes my age will be 43. Whew! Hard to comprehend being THAT old. And now here I am in 2014, having left the year 2000 and the age of 43 behind in the dust. And I don’t feel old at all. What I do feel is thankful. Thankful that I’ve found my calling in life by helping folks to preserve, celebrate, share their life stories – both with their current families and with generations to come. I’m also thankful for the evolving technology that’s made this all possible. So what’s ahead for 2014? Certainly, some things will stay the same. 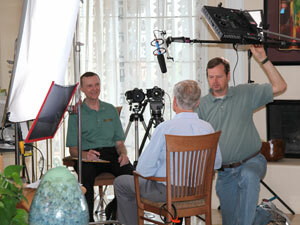 Family Legacy Video’s focus will continue to be on creating high-quality, legacy video keepsakes. But the company will continue to evolve. Over the years we’ve experimented with workshops and webinars and do-it-yourself products and services and learned a lot along the way. I’m hoping we can apply some lessons learned to expanding the company in the not too distant future, perhaps with an associate program of some kind, offering training and support to those wanting to start and run their own video biography companies under the Family Legacy Video banner. We’ll see what happens. What’s your goal for the coming year? If it’s to capture the life stories of one or more family members, don’t procrastinate. At least four storytellers I had the honor of working with in years past died during 2013. And while their passings were sad occasions, there was relief in knowing their images, voices and stories will live on to comfort, inspire and inform their families and friends. What is truly tragic is when the people we love pass without passing along their stories. When this happens, it’s like a library burning down, with irreplaceable family knowledge going up in smoke. Don’t let this happen to you. Get started TODAY. If Family Legacy video can help, feel free contact me. If you have questions about the process you’d like answered in future issues of this newsletter, shoot me an e-mail; I’ll be happy to answer you. Together we can make 2014 a year for creating, and saving, lifetimes of memories.